Brother non-laminated tape with standard adhesive is great to use indoors for hobbies, organising, or crafts, available in two different sizes and a choice of colours. M Tapes for Brother P-touch models PT-55, PT-65, PT-75, PT-85, PT-90, PT-100 and PT-110. Black print on a White background non-laminated tape for use with Brother P-Touch label printers. Brother P-Touch label tape cassette 9 mm x 8 metres. 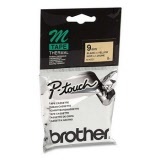 IMPORTANT the M-K221S, sold by some other retailers, is a 'starter' tape and is only 4 metres in length! Black print on a Blue background non-laminated tape for use with Brother P-Touch label printers. 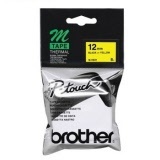 Black print on a Yellow background non-laminated tape for use with Brother P-Touch label printers. 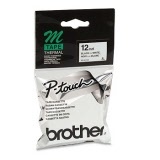 Brother P-Touch label tape cassette 12 mm x 8 metres.